The public ballot for tickets to Professor Stephen Hawking's thanksgiving service opened Saturday—with visitors from the future welcome to apply. Applicants need to give their birth date—but eagle-eyed fans of the man who dedicated his life's work to unravelling the mysteries of the universe spotted that it can be any day up to December 31, 2038. Potential applicants—from the future or otherwise—are forewarned not to apply if they cannot arrange their own transport and any necessary visas. What a great man, I wish I could be there. People like him who have suffered and worked hard to bring scientific illumination to humanity really sit at the top of the moral totem pole as far as I'm concerned. So much love for him and all the people who made it worth it by caring for him. I hope they know that the people who can show up there are a tiny fraction of the people all over the world who will be be remembering him and celebrating his life, present and future. I was at Einstein's funeral. You can see the HypnoV's I took on my time travel hlog. It was quite quaint. Now that I am younger, I prefer quieter events. After attending Marie Antoinette's beheading, I had PTSD, which I had cured next month using a cure invented by some broke guy named Bubba Nicholson who lived in the 23rd century. I'm a time traveler. I travel one day into the future every 24 hours, and have done so since birth. My time machine is broken, and the parts needed to repair it haven't been invented yet. "We have figured out how to travel through time at the speed of...regular time...with plastic bags"
Belief in time travel is one criteria I use to eliminate any further discussion with and psuedo scientist (other than sleep, suspended animation or coma). Another is big bang expansion, and probably the feasibility of a space elevator. Time travel won't be invented before 2038. People born that close to current events would have immense incentives to come here to interfere with current events. They could for example arrange assassinations of globally important leaders or candidates, or manipulate implausible candidates into leadership. There's a government organization for that. Didn't you see "Time Cop" or "MIB3"? People born that close to current events would have immense incentives to come here to interfere with current events. Only if their current events aren't any worse. In any case you probably don't want to interfere with history at all for fear of erasing yourself (i.e. if you had a time machine you'd probably only want to go back as far as you were born and not any earlier). Why would you expect to notice if attended? The whole point is that you are not restricted to the normal experience of time during the process. Any interference would have consequence. You'd only likely notice any interference if you slept though it. Pun totally intended :D Is this born of the flawed assumption that a time traveller sits in a device to move through time then experiences it's normal course on arrival akin to everyone else? surely that "cure" alone would be worth billions to the VA and US Gov't! PS - you're still presenting false and fraudulent claims. I always figured it had something to do with split leather. And psueychology. And people named Psmythe. Maybe I should change my handle to Pschneib. And OTBW how exactly does one go about interfering with "someone died?" They're *dead*. I once asked someone who'd been Safety Director at a major chip foundry if he'd ever given CPR. He said, "No, you only do CPR on dead people and I've never run across any; they're pretty rare." You have to have a rather dark streak in your humor to get that. My freshman science students benefit from Stephen Hawkings example of overcoming adversity. When we discuss disabilities in freshman high school biology, his well known example provides a framework for debate on the value of life despite a fetus having congenital deficiencies. 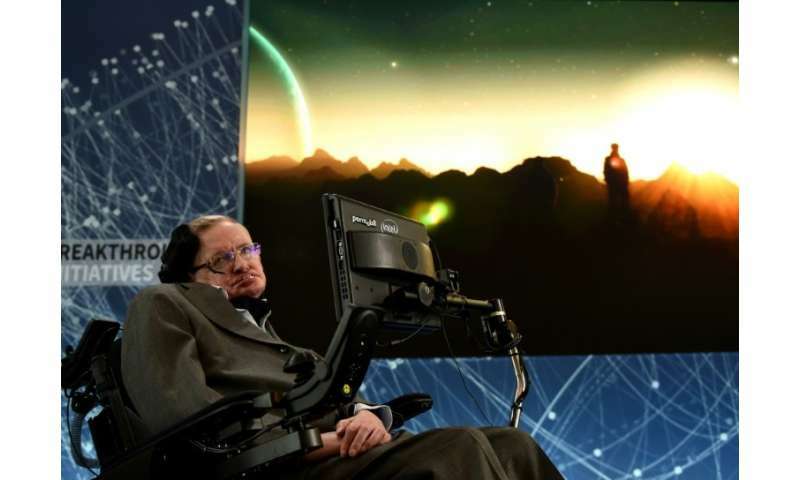 Who would not agree that despite Stephen Hawkings physical disabilities, he has made a valuable contribution to science. So it opened up a two-sided debate among our honors students as to this topic. Also Hawkings is a marvelous example of not allowing adversity or physical limitations from interfering with his productivity and contributions to our understanding of the universe.